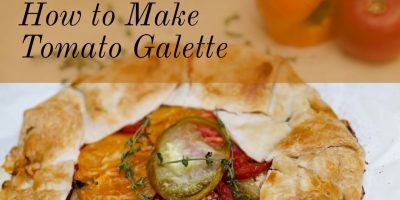 This galette can be made with any type of tomato so don’t limit this recipe to just heirloom tomatoes. Preheat the oven to 375°. Heat a small skillet over medium heat and add the olive oil. When hot, add the sliced onion. Heat the onion, stirring often under dark brown and caramelized. This can take up to 20 minutes. Add a little water if the onion starts to stick. Onion can be made in advance. Prepare a baking sheet with a piece of parchment paper. Roll out the pie crust to a 20 inch round and place it on the parchment paper. Combine the ricotta, leaves from about 5 thyme springs and the onion. Spread along the center of the crust, leaving about a 2 inch border. Add the slices of tomato over the cheese. Sprinkle them with salt and the remaining thyme leaves. Gently fold the edges of the crust up and over the tomatoes. Use a pastry brush to coat the edge of the crust in egg wash. If desired, sprinkle with more salt and thyme leaves. Bake for 45 minutes. Serve warm.